Technical Analysis with crypto is tricky and its performance can be a little...mixed. I previously wrote an article on circulating supply and how that seems to impact on coin price. We found a very strong relationship between the two but that generally the big coins were able to break away from that. Particularly BTC, ETH, XRP and to a lesser extent newer boys on the block BCH and EOS. 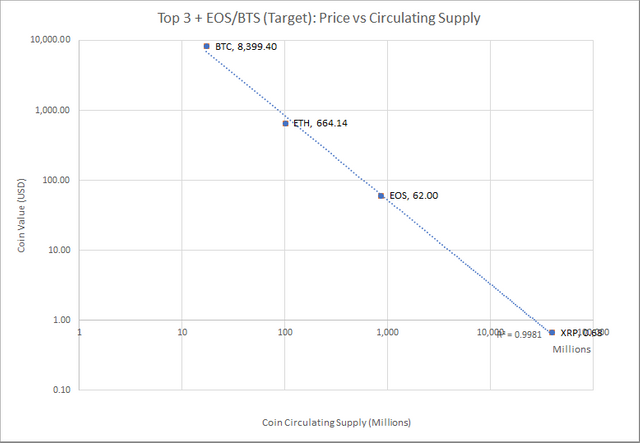 I wanted to look at how the top 3 coins perform considering their circulating supply and how strong the relationship is. The answer is that the relationship between circulating supply and coin price is even stronger with an R^2 = 0.9981! Remember that R^2 = 1.0 would imply a perfect relationship between circulating supply and coin price! It has to be noted this is a very small data set of three coins, but if we took this as an indication of what the market is willing to 'tolerate' on coin price vs circulating supply then what could we infer from it? I bought some EOS early on (nowhere near enough) but have resisted jumping in for more recently because I have felt it is overpriced. But is it? The coin is just entering the public consciousness and is yet to launch. 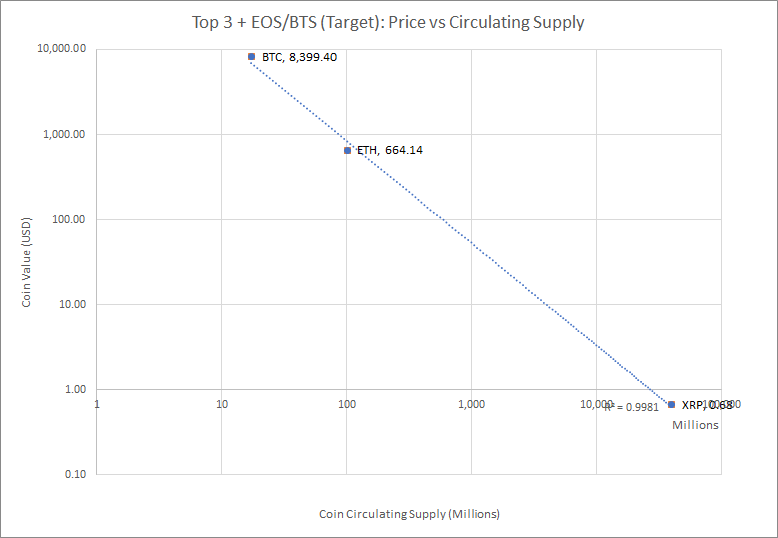 If it is destined to perform the same as the top three coins then what is the target price? 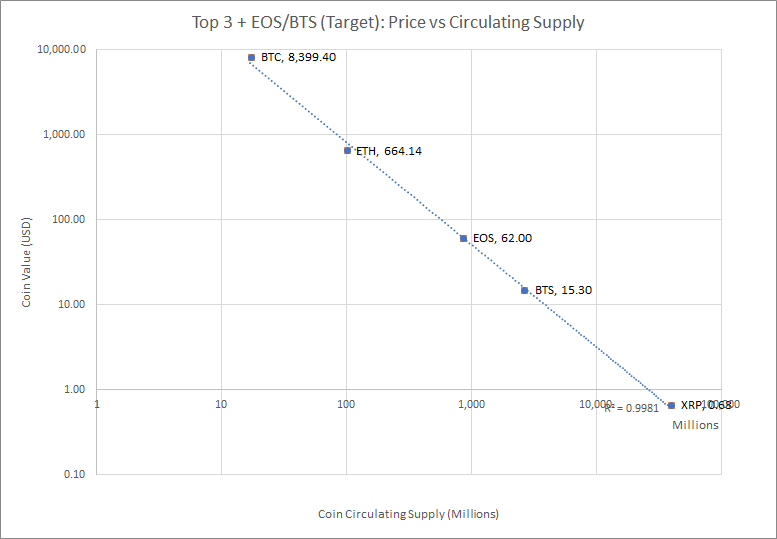 The chart implies that given current BTC market prices we could see EOS at $62. And just to look at another coin I am interested in...my beloved and long undervalued Bitshares (BTS). What would our target price be if BTS manages to enter the public consciousness in the same way as the top coins? Note: none of the above is financial advice, I'm just trying to explore this 'non conventional' space with some alternative approaches to the technical analysis.